COM ranks fifth in the nation in the number of degrees awarded in science technologies/technicians in 2013, according to a recent report by magazine Community College Week. 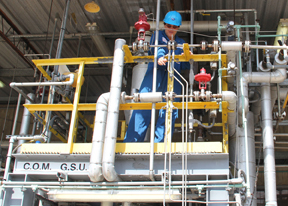 COM graduated 79 Process Technology Program students in 2013, a four percent increase. The COM program relies on industry partnerships and an advisory council of industry representatives to set program standards and determine which topics students will master. The two-year program teaches students through labs and hands-on classes operating industry equipment such as the glycol separation unit. The program also partners with the ExxonMobil Community College Petrochemical Initiative, which seeks to provide training and funding for the next generation of petrochemical workers to keep pace with industry growth. This fall the initiative awarded four COM students scholarships. As industry grows along the Gulf Coast, job opportunities for program graduates multiply. Ceadric Bourgeois, 33, of Texas City, will graduate in December and looks forward to career options. Process technology graduates are in demand in food processing, chemical, pharmaceutical and petrochemical industries. For more information on the COM Process Technology Program, visit www.com.edu/ptec or call 409-933-8536.